I know that some of you miss reports of Simon. Well, he is still his same silly self. 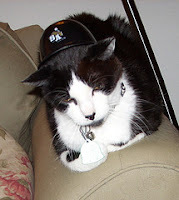 Here he is, sporting his San Antonio Missions batting helmet. Or maybe it was an ice cream dish, issued on opening night... Either way, he's being very patient! Thanks to my BIL, Felix, for taking this picture. You can see more pictures of Simon on Felix's Flickr site, as well as pictures of Simon's "sister," Schuster, our friend Jody's new baby kitty, Gracie, and fish that Felix caught. And also a few human friends and family members! 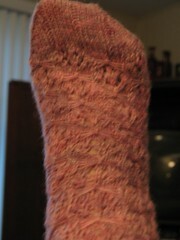 I've also finished one cat-related sock -- a Whiskers and Paw Prints. I love these socks - or at least the one that's done! It fits great. I'm not completely happy about the short-row heel. One side looks perfect, but the other was quite holey. 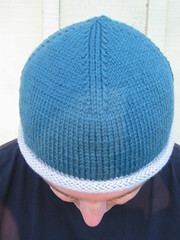 I sewed the holes shut from the inside, and it looks fine on, but I'm hoping I do better with the second sock. Schuster? Is your sister a libarian too??? I love it! Nice whisker and paw print sock! That's such a cute pattern. A cat that looks like Charlie Chaplin. Cool! Ah, Simon, such a handsome devil! Your sock looks great. It might not be you - could just be the type of SR heel. What is it about s/r heels that makes them do that! grr. bezzie, I'm not a librarian, but I do love to read. I got Simon first (he was originally named Annabelle because we thought he was a she! ), then a year later I got a baby girl kitty, and I thought "Simon and Schuster" was just cute, and a nice nod to my love of books. The sock does look awesome, and yes, taking a picture of your own foot is one of the hardest things to do in the world. Right up there next to getting someone else to take a picture of your foot. Pheet are hard to photograph! Hey, I had to take a picture of my friend Gina's tongue. Seriously. A foot MUST be easier.